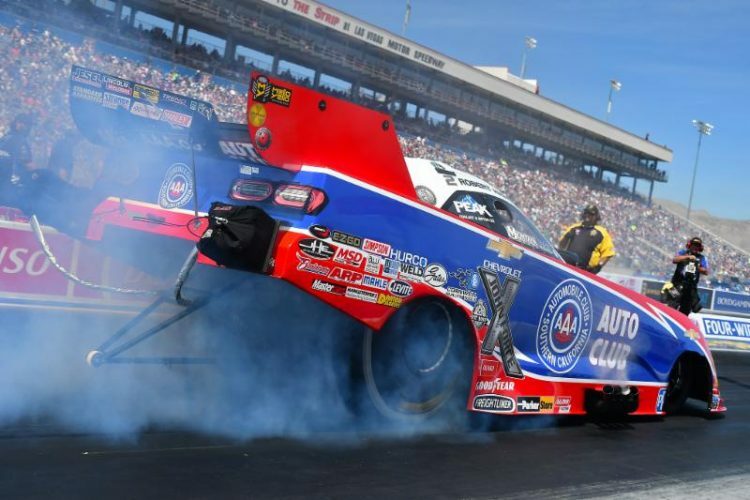 NHRA Mello Yello Drag Racing Series points leader Robert Hight and the AAA Texas team are heading to the Mopar Express Lane NHRA SpringNationals with momentum on their side and a history of doing well at Houston Raceway Park. To say Hight, who finished second in the NHRA Mello Yello Drag Racing Series points in 2018, started his 2019 campaign off on the right foot would be an understatement. Three-consecutive No. 1 qualifiers capped off by two victories at the Winternationals and 50th anniversary Gatornationals have the two-time world champion sitting comfortably in the points lead, even after Hight and his Chevy Camaro, tuned by Jimmy Prock and Chris Cunningham, took a rare misstep, qualifying No. 9 and making a first-round exit at the most recent event in Las Vegas. Hight has two wins at the SpringNationals, his first was the first Funny Car victory of his career and most recent was in 2014. While it’s been four years since Hight has seen the winner’s circle in Houston, the AAA Texas team has been knocking on victory’s door for the past two years. In 2017, Hight qualified fourth and defeated current reigning Funny Car champion J.R. Todd and, then teammate, Courtney Force on his way to a runner-up finish against 2016 world champion Ron Capps. Last year, Hight took the No. 1 qualifying position and rallied past Jonnie Lindberg and veteran Jack Beckman before coming up short to Todd whom he battled with until the final day of the season for the championship. Qualifying at the NHRA SpringNationals starts at 4:30 p.m. and 7:15 p.m. on Friday and at 2:30 p.m. and 5 p.m. on Saturday. Eliminations are scheduled to begin Sunday at 11 a.m. Catch Friday qualifying on FOX Sports 1 (FS1) from 9:30 p.m. to 11:00 p.m. ET. Finals will air Sunday from 2:00 to 3:00 p.m. and will be live from 3:00 to 5:00 p.m.